Why control YOUR cooling with ENERSAVE? ENERSAVE now controls the cooling of over 8 million bushels of fruit in Michigan, Canada, and New York averaging 1.5 kilowatts of savings per bushel per year. This is a total of over 12 million kilowatt-hours per year of savings—enough to power a small city. 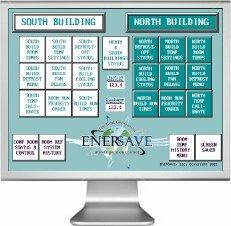 The ENERSAVE System has been supported with customer grants from three different sources. We can optimize your cooling system and controls. Monitor your energy use from your monitor!